As we all know I am a nail polish addict. I love trying the latest nail colors and cool textures that come out each season.My love for blue and green polishes started in 2009 with the release of Essie Mint Candy Apple (blog post to come soon).While I am not the biggest fan of the ever so difficult to remove glitter polish, I do love some striking duo-chrome action on the nails. Chanel recently released Chanel L’Ete Papillon de Chanel Collection for Summer 2013. While the entire collection had me wishing I didn’t spend all my money on excessive amounts of iced coffee, there was one item I knew I must add to my already large nail polish collection-Chanel Le Vernis in Azure. 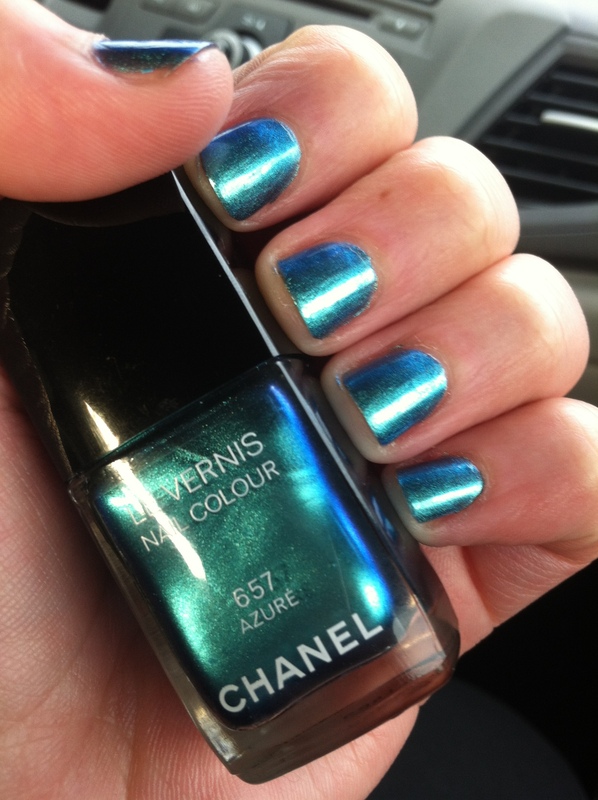 This swoon-worthy nail lacquer from Chanel is unlike any polish I have seen before. It is described as a metallic blue-green, but that description does not do it justice. It changes drastically depending on the lighting, revealing a truly chameleon color. It changes from a shimmery green to a true turquoise shade. The duo-chrome effect of this nail polish has me mesmerized. It is truly a gorgeous color, one that I am happy to have in my nail polish stash. Do you have any new nail polishes you’re obsessing over? Makeup lovers around the globe are always searching for the next best lip product. One that will leave your lips moisturized while adding the perfect amount of color and shine. Well have no fear, CoverGirl has new lippie that is definitely a contender. The CoverGirl LipPerfection Jumbo Gloss Balm is a jumbo balm that leaves behind incredibly soft lips with a gorgeous hint of shine. These are the perfect lip product for daily use and come in 16 beautiful shades. Not only are they infused with Shea and Mango butters to nourish your lips , but the formula is non-sticky and hassle-free. These lippies come in a sleek and easy “twist up” form which is perfect for on the go. 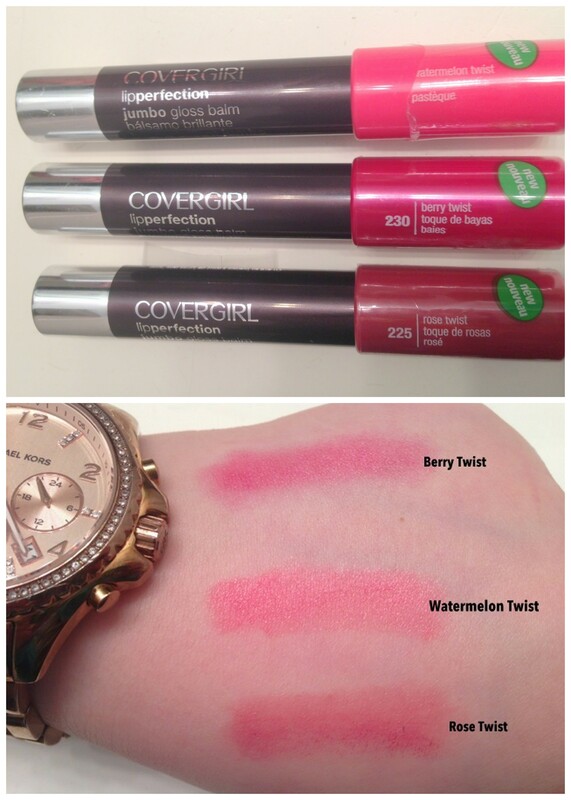 I love all of the colors, but my personal favorite is Watermelon Twist. It is the perfect coral meets bright pink shade and leaves my lips feeling soft and silky. This color is a must for all the beauty obsessed ladies out there. I can’t wait to pick up more of these stunning glossy lip balms. Go pick up your new CoverGirl LipPerfection Jumbo Gloss Balm today at your local drugstore, target, ulta or any other retailer that sells CoverGirl makeup.